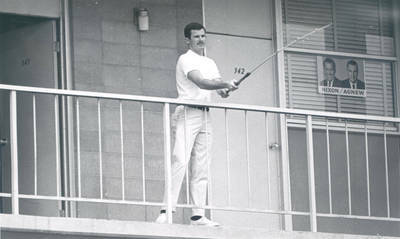 "Balcony, Davis Community Center and Apartments, Chapman College, Orang"
Student on balcony with fishing pole at Davis Community Center and Apartments. Nixon/Agnew poster in window--old or another dormitory? Davis opened September, 1974, at 625 North Grand Street, Orange, California, named in honor of Chapman College's fourth president, Dr. John L. Davis. BW photograph; 4.75" x 7.75"